In the never-ending string of incredible visuals brought to life by Pixar, Coco (2017) continues this trend into the afterlife. At this point, I’m convinced Pixar could just go ahead and shoot live video and put their animated characters in the scene and I’d still think the whole thing was animated. The interplay of color, light, and shadow really come out in this celebration of Mexican culture. All spectacular visuals aside, Pixar again delivers on an emotional impact that left me crying, as always. When it comes to new ideas, Pixar certainly still knows how to create a visually-compelling story. While Coco has a lot going for it, there are a few weaknesses, some of which are my own opinion based on my likes and dislikes. I know the film mostly targets children (and older children at that), but the plot was just a smidge too predictable. Sure, it was enjoyable to see my hypotheses play out on the screen, but the twists weren’t anything too groundbreaking. Secondly, I’m sure the street dog was endearing for those who like dogs, but I found it to be more annoying than a vital part of the plot. Not necessarily a weakness, I’m a little torn on the message of the movie. Having recently visited Mexico for the first time this January, I had a greater appreciation of the culture presented here. However, even if the “family first” motif felt a little bit like the plot from a Fast and Furious film, I also wanted to root for the young boy who wanted to pursue his passions and dreams despite his family’s adamant restrictions. By the end, there’s a happy medium, but when I want the main character to divorce himself from his family so he can do what he enjoys, then there might be a problem. 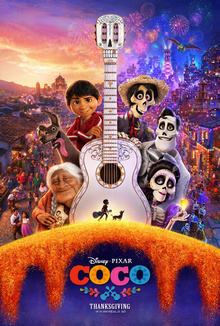 A fantastic and culturally-rich masterpiece from Pixar, I give Coco 4.5 stars out of 5.